Read a report today about how eBay was cooling their new data center outside Phoenix with hot water at desert warmed 86F (30C) temperatures (see Breaking new ground on data center efficiency). And to literally top it all off, they are running data center containers on the roof which they claim have a Green Grid’s PUE™ (Power Use Efficiency) of 1.044 in summer with servers at maximum load. Now this doesn’t count some of the transformers and other power conditioning that is needed but is still impressive nevertheless. The average for the whole data center a PUE of 1.35 is not the best in the industry but considerably better than average. We have talked about green data centers before with a NetApp data center having an expected PUE of 1.2 (see Building a green data center). One secret to these PUE’s is running the servers at hotter than normal temperatures. This is a data center consolidation project so they were also able to start with a blank sheet of paper. They started by reducing the number of server types down to two, one for high performance computing and the other for big data analytics (Hadoop cluster). Both sets of servers were selected with power efficiency in mind. Another server capability requested by eBay was the ability to dynamically change server clock speed so it could idle or speed up servers as demand dictated. 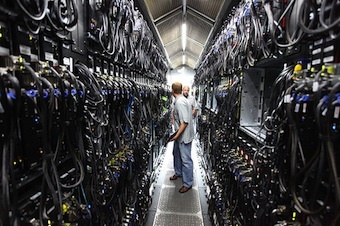 In this way they could turn down servers sheding power consumption and/or turn up servers to peak performance, remotely. The data center cooling was designed with two independent loops, one a traditional standard air conditioned loop that delivered water at 55F(13C) and the other, a hot water loop that delivered hot water 86F(30C), using water from a cooling tower exposed to the desert air. eBay started out thinking they would use the air conditioned loop more often in the summer months and less often in winter. But in the end they found they could get by with just using the hot water loop year round and use the cold water loop for some spot cooling, where necessary. Also the building was specially built to be able to support up to 12-data center containers on the roof. There were over 4920 servers deployed in three containers currently on the roof and one container of 1500 servers was lifted from the truck and in place in 22 minutes. The containers were designed for direct exposure the desert environment (up tho 122F or 50C) and were cooled using adiabatic cooling. More details are available in the Green Grid report.